"…Of 44 species of crops commonly grown in North America, about 66% were identified … as being more or less dependent upon insects for pollination…. "…[O]f the world's 94 major crop plants, 18% are pollinated by the wind, 80% by insects (92% of these by bees), and about 2% by birds." — What Good Are Bugs? 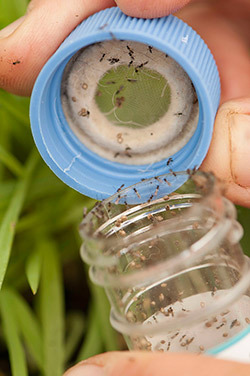 Mention insects to growers, and many will think of pests and different ways to eliminate them. Many others of us are intrigued by the hyperdiversity of insects — while some devour crops, most are benign, and others are integral to farming success. By turning our flowers into fruit (the pollinators), attacking crop pests (the natural enemies), and providing innumerable other ecosystem services, beneficial insects help make farms more profitable and sustainable. Of the 1.5 million formally described species on earth, the majority are insects. Yet the precise roles of insects and their significance are still poorly understood by most of us. In this article we look at a few examples that work to the benefit to growers. Next, we outline 5 steps for establishing an insectary — a flowering "set-aside" or "bee pasture" — to help support our mutualistic relationships longer-term. For the curious, we offer a list of further reading . 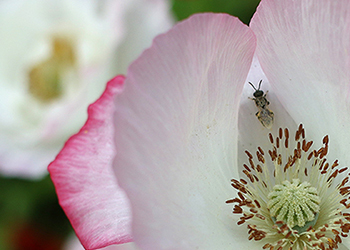 By learning how to attract and sustain populations of beneficial insects, your work as a grower can become more rewarding. Natural Enemies: "Hey, it's a living…"
Parasitoid wasps, ladybeetles, lacewings, and other beneficial insects can help control pest populations. The parasitoid braconid wasp, Cotesia congregates, injects its eggs into the living body of both tobacco and tomato hornworms. The eggs hatch, and the wasp larvae consume the bodily fluids of the hornworm, eventually emerging through the pest, pupating, and leaving the caterpillar to its death. Anyone who grows asparagus is familiar with the common asparagus beetle. The grayish larvae, covered in their own excrement (the technical term for which is frass ) munch on ferns, rendering spears unmarketable and decreasing the plants' ability to photosynthesize and store energy. Like a band of warriors, parasitoid wasps can kill the majority of common asparagus beetles by parasitizing their eggs — in some cases up to 71% of them! This beneficial wasp not only lays its eggs inside of the pests' eggs, it also consumes eggs as an adult. The unchecked growth of aphid populations quickly reduces the marketability of crops. 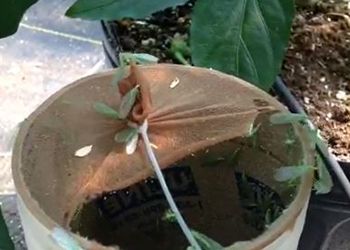 This sap-sucking pest can even transmit plant diseases. Healthy populations of beneficial insects help farmers keep these pests in check. Lady beetle larvae, for example, consume 100–400 aphids during their development (around 23 aphids per day). As adults they continue to consume aphids at a lesser rate, and moderate population explosions by laying eggs in areas where aphid populations are increasing. 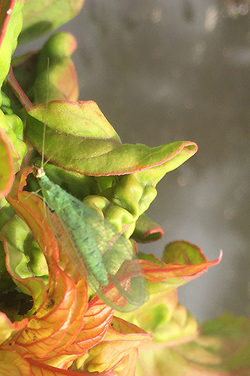 Green lacewing on aphid-infested Celosia. A host of other natural enemies play major roles in aphid control, including lacewings, ground beetles, and hover flies to name a few. The predatory larvae of brightly colored hover flies (also known as flower flies or syrphids), consume legions of aphids to fuel their growth into winged, nectar-feeding adults. Another method of aphid control is to establish populations of certain aphid species that do not feed on the particular crops you're trying to protect, yet still provide food for natural enemies. Here at Johnny's Selected Seeds, we use banker plants to support these non-pest aphids, thereby maintaining healthy populations of aphid predators in the greenhouse. 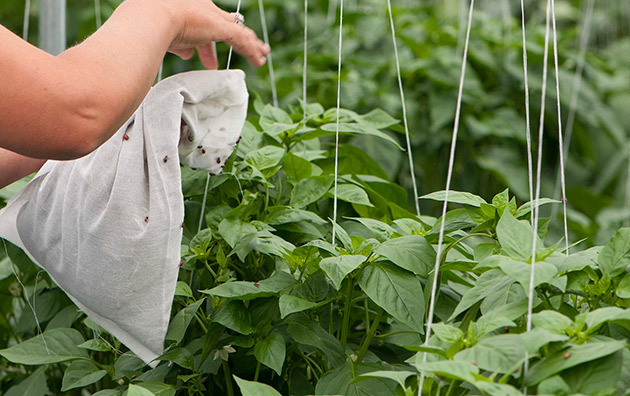 Live releases of lady beetles, lacewings, and parasitoid wasps — all supported by flower plantings and strategic placement of banker plants — are essential components of the integrated pest management approach taken here at Johnny's Selected Seeds. Ground beetles are prodigious weed seed consumers. Ground beetles are another under-heralded farm worker. These cosmopolitan beetles in the family Carabidae consume weed seeds, in some cases decreasing weed pressure in the following year by 80–90%! Farmers can actively encourage the beetles' consumption of weed seeds by making appropriate management decisions. For example, recently shed weed seeds can be allowed to sit on the soil surface, where they are most vulnerable to predation, instead of tilling them in. 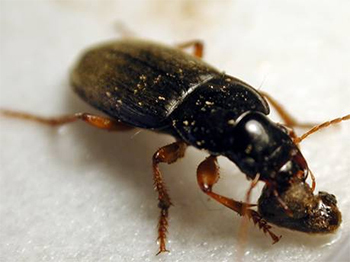 Ground beetles are also opportunistic predators of many pests, including aphids, cutworms, armyworms, and cucumber beetles, among others. 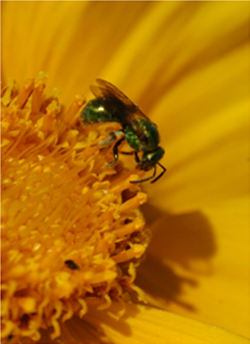 "…A surprising spectrum of native invertebrates pollinates crop plants: midges, blowflies, soldier flies, syrphid flower flies, hawk-moths, nitidulid beetles, checkered beetles, ladybird beetles, fig wasps, sphecid and vespid wasps, sweat bees, squash and gourd bees, carpenter bees, andrenid bees, bumblebees, mason bees, leafcutter bees, cactus-loving bees…." Fat and fuzzy bumblebee queens can be seen early in the spring, looking for prime nesting sites to start a colony. Each queen's worker bees will visit flowers throughout the season, turning blueberry, raspberry, apple blossoms, and more into tasty, high-value fruit. 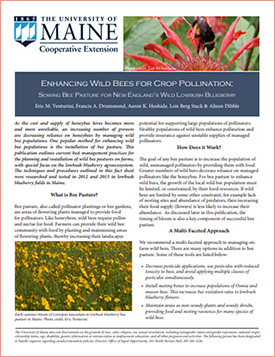 Crop pollination is often one of the major input costs of pollinator-dependant growers. Some farmers annually rent or purchase managed pollinators for crop pollination. Commercially available pollination options include honeybee hives, cardboard boxes of bumblebees, and small tubes of solitary orchard and alfalfa leafcutter bees. Pollinator-dependant greenhouse, high tunnel, and hoophouse growers commonly purchase commercial bumblebee colonies to enhance both the size and number of fruit produced. Wild, unmanaged bees and other pollinators have been doing this work unbidden for millennia. In fact, in most crops throughout the world, wild bees contribute more to pollination than honeybees, providing a necessary, but free service to growers. These are but a small fraction of the beneficial insects hard at work, managing pests, protecting the integrity of our crops, and turning flowers into marketable fruit, in fields, gardens, hoophouses, and greenhouses. 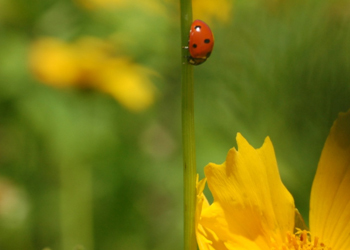 Lady beetles are beneficial predators that feed on aphids and other soft-bodied pests. In recent years, many native lady beetle species populations have been displaced through the introduction of exotic ladybug species. For assistance in distinguishing native from exotic types, contact your local cooperative extension agent. In Ohio, where the lady beetle reigns as state insect, the University Extension has produced an identification guide with images and key features. With modern production techniques and an ever-improving understanding of the life cycles of beneficial insects, innovative growers can adopt strategies to help them work for the bottom line instead of against it. One such strategy is to install permanent or semipermanent set-asides of flowering plants for pollinators, sometimes called "insectaries." The best flower mixtures for this purpose contain both annual and perennial wildflowers that provide pollen, nectar, and habitat for beneficial insects year-round. Once established, they fill the entire season with bloom, so that at any given part of their active phase, beneficial insects can frequent two or three simultaneously blooming flowers. Some insectaries additionally enhance the habitat that supports the beneficial insects' quiescent phase. Adult lacewings emerge from the pupal stage to find insectary plantings to sustain them in and around the greenhouse at Johnny's Research Farm. In the larval stage lacewings are voracious predators of many soft-bodied insect pests. This timing of bloom is essential. Some beneficial insects, like bumblebees, actively forage for pollen and nectar from the early spring to well after the first frost. Unlike honeybees, bumblebees have a very limited ability to store food, and thus require a season-long supply if growers wish to maintain healthy populations to pollinate crops. Hover flies, parasitoid wasps, lacewings, predatory wasps, and a large number of other beneficials all require nectar as adults. Research has shown that flower-rich plantings not only attract these beneficial insects to your farm, but can actually increase their local populations, help to manage pest populations, and increase crop yields through improved crop pollination and pest control. To help growers to take advantage of beneficial insects, Johnny's offers a selection of flower, herb, and farm seed varieties known to Attract Beneficial Insects. Included are several different mixtures of annual and perennial flowering plants that are designed to support natural enemy and pollinator populations. A sweat bee (family Halictidae) pays a visit to a patch of our Bee Feed Mix. Beneficial Insect Attractant Mix. This seed mix contains flowers that are especially attractive to both natural enemies, such as sweet alyssum, cilantro, false Queen Anne's lace, fennel, and dill, and those more heavily used by pollinators, such as coreopsis, clover, bergamot and blazing star. This mix offers growers a broad approach to beneficial insect management, providing food for a large swath of both natural enemies and pollinators throughout the season. Bee Feed Mix. This seed mix targets pollinators by providing a season-long abundance of a variety of flowers that are especially attractive to bees. This type of flower mixture is especially useful when planted adjacent to crops that rely on, or benefit from pollination. Examples of such crops include orchards, small fruits, berries, tomatoes, squash, pumpkins, cucumbers, and melons. Flower mixes are easy to establish, provided the grower follows some general guidelines. The steps outlined below are adapted from a University of Maine Cooperative Extension Fact Sheet coauthored by Eric Venturini, former Education Coordinator here at Johnny's. The first step to successful establishment of small-seeded flower mixes is the control of weeds, especially weed seeds. A properly prepared seed bed sown to a perennial mixture of flowering plants can continue to provide beneficial insects with forage for 5–10 years only if weed pressure is minimized. In fact, if weeds are not controlled prior to planting, they can and will out-compete the slow-growing perennial flowers within the first year. Methods that growers can use to drastically reduce the weed seed bank include stale-seed bedding, flame-weeding, soil solarization, topsoil removal, a combination of cover-cropping and stale-seed bedding, or, if necessary, judicious repeat applications of herbicides. Even two or three cycles of stale-seed bedding in the spring prior to sowing a flower mix can greatly reduce weed competition and help to increase the longevity of the planting. See our article on Weed Management Basics to learn more. Flowering mixes require very little fertility input. In wildflower plantings, the addition of fertilizers can actually cause more harm than good, by providing weeds with the materials that they need for growth without benefiting the sown species. We do suggest testing the pH of your soil to determine whether the addition of lime or sulfur is required. A pH that is between 5.5 and 7.0 should be adequate for successful flower establishment. Light shallow tillage to break up the soil structure prior to sowing seed will help increase germination and emergence. Native seed drills, hydro-seeders, and spin seeders like the Ev-n-Spred® are all effective tools for seeding beneficial insect flower mixes. 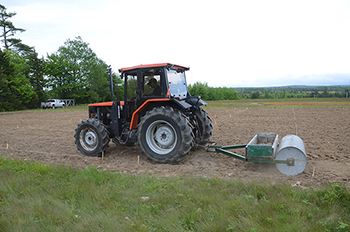 Except in extremely large areas, the Ev-n-Spred Seeder is a practical option that can be easily used to seed plantings of up to several acres. Here, a cement-filled hot water tank is being used to compact the soil after sowing. Due to the extremely small size of many of the wildflower seeds within these mixes, when broadcast-seeding, flower seed should be bulked with sand, vermiculite, or something similar to help ensure that the seed is distributed evenly throughout the planted area. After sowing, lightly rake the area with a landscaping rake. Small-seeded annual and perennial flowers, especially wildflowers, require seed-to-soil contact to successfully germinate and establish. Compaction of the seedbed after sowing is extremely important for success. Culti-packers and lawn rollers are both very effective tools for pressing the seeds into the soil. Once established, these mixes require very little care. During the first year, however, irrigating the stand with ¼ to 1 inch of water per week can help establish slow-growing perennials. We recommend mowing your flower mix once each year in the late fall, after the last flowers have finished blooming. "Ecosystem services are the direct and indirect contributions of ecosystems to human well-being… They support directly or indirectly our survival and quality of life.…." Beneficial insects go about their business in countless, complex ways that are integral not just to agriculture but to the entire web of life. Of all the crop plants commonly grown around the world, a large majority are more or less dependent upon insects — both for pollination, competitive pressure against pests, and a wide variety of other ecosystem services. Without them, our lives would be very different, our diets very poor and strange indeed. A resourceful grower is one who provides them safe haven and puts their small but mighty talents to good purpose.